All of our puppies are whelped and raised in our home, so they are the center of daily life. Great care is taken to expose them to a variety of sights, sounds, and experiences. The puppies will also be exposed to bird wings, pigeons and ducks. Weather permitting, our puppies will be exposed to water for swimming. Our puppies leave for their new homes no sooner than 8 weeks of age. Before they leave with their new families, they will be wormed, had their first eye exam and are vet checked for overall health and congenital problems. 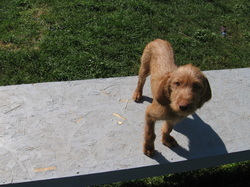 Our puppies tails are docked 1/4 off, along with dew claws, per the AKC and FCI standard. The puppies temperaments are evaluated and matched with homes whose lifestyles and desires are compatible with the evaluation results. We will work with you to pick the best puppy for your household. Since we normally do not choose our own puppy before 8-10 weeks, we will not know which puppy is yours until after that. We have put all we can into producing the best and have done this breeding for ourselves. We have first choice of any litter we breed. We will come up with a theme for use in the registered name of your new puppy and supply you with a list of registration names to pick from. All puppies will have the kennel name of “Bird Mtn” within their registered name. All puppies are sent home with a breeder written puppy book which includes information about the parents, feeding, socializing, care and training tips for the puppy. We highly recommend you locate a 'puppy kindergarten' class, make contact with a veterinarian and take time to 'puppy-proof' your home and yard prior to your new family member arriving. Any interested individuals must fill out our puppy questionnaire as a first step to be considered as a puppy buyer. We take the well being of any lives we bring into this world very seriously and only want these puppies going to loving homes that can adequately meet all of their needs. For this reason, we will only sell puppies to homes where they will live indoors with their owners. Reservations for puppies are taken on an individual basis. Deposits taken are to hold a puppy for you until they are 8 to 10 weeks old, but do not determine an order of placement. Deposits of $200 are taken only after the puppies are born. We prefer that you to come to our house in CO to pick up your new puppy. Feel free to contact us at any time to talk dogs or find out the latest in our plans for the future! ***Please note that we are not taking questionnairs at this time. We have placed all of the pups from our 1013 litter. We will probably breed again in a few years. If you are interested in one of our pups please email the form to us and plan on a phone call. I prefer to speak to you directly to make sure we are a good fit for one another.